The discovery of Ahriman came around when i was duoing with a friend on Demon pets in Castle Zvahl Baileys. There would always be this pesky Morbid Eye that would get in the way of clean pulls. Luckily for us, Kallo was romping around in the zone, and he sent me a /tell asking if I would like that eye cleared out, because he knew how pesky that thing can get. After a few times clearing it i noticed another THF running around killing the Morbid Eyes in the area. After doing a little research i found out that the drops from the Ahriman type mobs were going for a pretty penny. Coming back later as PLD/THF, the drop rate wasn't as great with TH1, but it wasn't horrible. 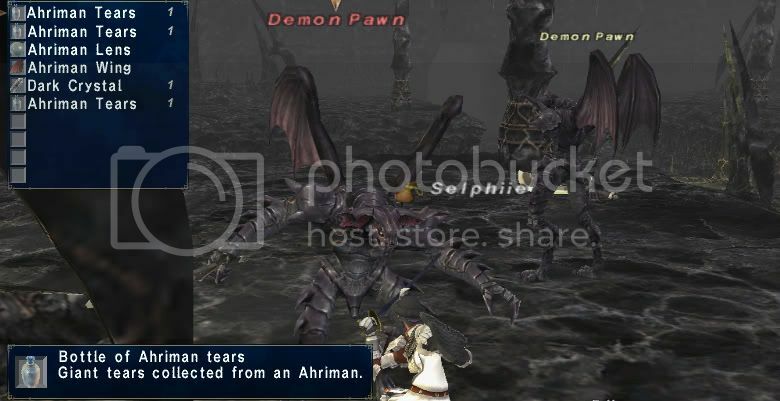 However looking more into it i found the 4 Morbid eyes around the teleporter in the keep and the Deadly Iris' near the throne room have a 50% Drop rate on the Ahriman tears. They also drop wings, and for Alchemists, the lens. For 75s you don't get aggro from the demons for they con too weak/low low EP, so you can easily romp around from the bottom 4 Morbid Eyes in the Keep to the Deadly Iris at the top. Usually no competition since the trip is just so tedious. /thf you can steal the tears and still get the tears as a drop. 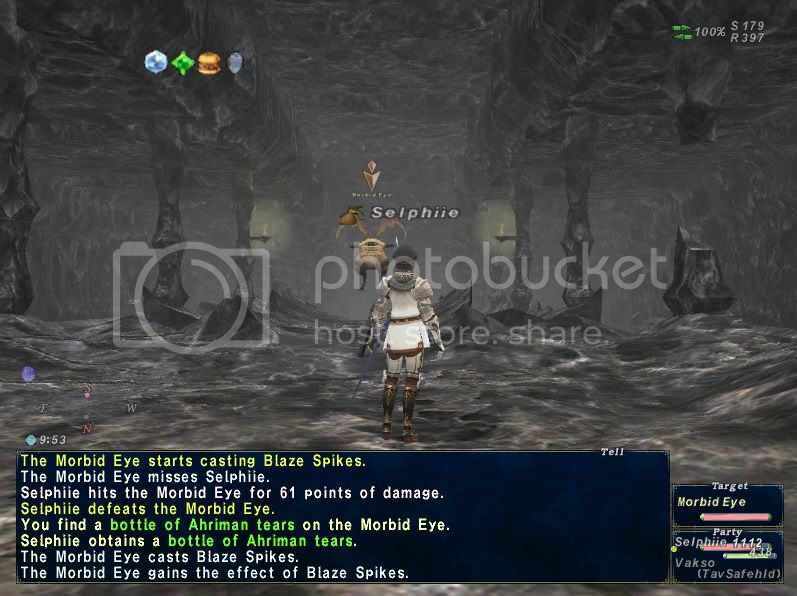 I had a Alchemy friend come out with me once to farm these eyes and the Lens can actually be crafted into Prism Powders. I'm not sure on the LV needed though. That's lvl 36 alchemy if I remember well. And you need some glass fiber with you as long as light crystal.